One of the pleasures of block-based-building phenomenon Minecraft is the sense of exploration it can engender. There’s a certain kind of wonder to be found in cresting a wooded hill, only to see yourself staring out over a vast, frozen ocean or densely packed jungle. The feeling is even more prominent in the game’s online worlds, where every twist of the path can lead to an elaborately crafted mansion or bizarre statue left behind by some past player. The people behind the Minecraft Geological Survey, a massive effort to catalog information about 170,000 publicly posted Minecraft worlds, seem to agree with that sentiment. 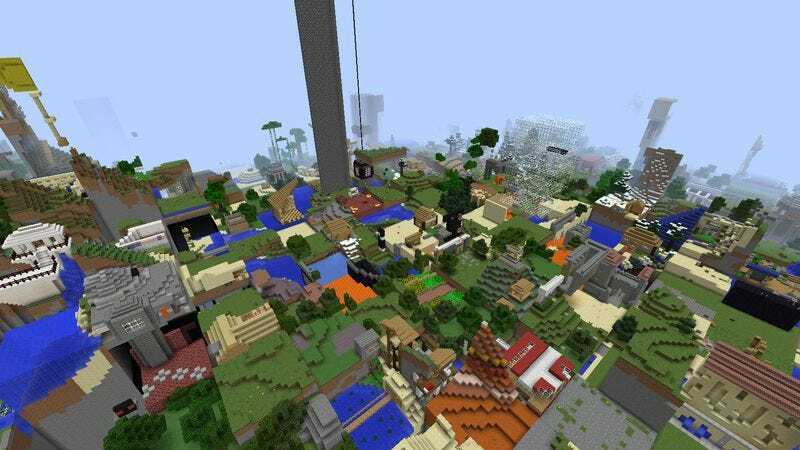 Using a small portion of their 12GB data archive, they’ve constructed “The Reef,” a downloadable map that takes “interesting”—i.e., containing signs of player action—chunks of different Minecraft worlds and stitches them together into a single map. The result is a bizarre checkerboard, with one of a thousand player’s creative efforts—often cut in half or left in cross-section by the borders of the chunk—taking up each individual square. Wandering through, you’ll find houses, puzzles, statues, improbable oceans, mountain castles, zoos, and some things that beggar description. Walking through it (or turning on Creative mode and flying above it, as we did in the screenshots below), is both disorienting and fascinating, as you travel through hundreds and hundreds of different people’s ideas of what they want to see in a virtual world. An even larger version of The Reef, designed for multiplayer groups to explore, is currently in development. Minecraft players can download the original, single-player version of The Reef (and, if so inclined, the Minecraft Geological Survey’s huge database of sampled worlds) for themselves, here.